We have prepared selected templates for download. The layout templates available below are designed for High Die Cutting. 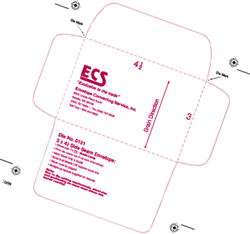 Due to High Die Cutting requirements, the sheet size and position on the sheet must follow the layout template exactly. Simply download the appropriate EPS below. Letterpress Die Cutting requires a larger one-up sheet size than High Die Cutting. Check the Letterpress Sheet Size Guide for the minimum size you need and center the template on the sheet. A larger sheet is ok! For more information on other one-up and multiple-up templates, or if you would prefer to have the templates (on CD) mailed to you, give us a call. Copyright � 2000 - 2018, ECS, Inc.